Arfeen international is one of the leading business groups in Pakistan, with a solid reputation of innovation , integrity and professionalism. The group has pioneered in a wide spectrum of activities including trading, manufacturing, real estate, entertainment, construction, telecom, building materials and many more coming. Division petrochimique, Arfeen international specializes in marketing , sales and distribution of petrochemicals with an unparalleled reputation and rich, successful history of representing major international and multinational companies from around the globe. We are one of the most well recognized suppliers of raw materials, ingredients and services to the pharmaceuticals, plastics, paints and coatings, packaging and industrial chemical industries in the country. In 1886 the arfeen group had a humble beginning in Delhi of the then undivided India by our Great Grand Father Mr. Shams-ul-Arfeen. The enterprise dealt with finished and raw pharmaceutical products. The company was called Shams-ul-Arfeen &amp; company. With the partition of India and creation of Pakistan in 1947, the second generation of Arfeens headed by Mr. Firoz-ul- Arfeen traveled to Pakistan and established the companies’ headquarters in Karachi. By this time the company had developed a solid reputation of sound business ethics and dynamic approach to the newly created market. However the company was still small and mostly focused on its historic business of pharmaceutical products. With the arrival of the 3rd generation of the Arfeens came a boost of fresh energy and new ideas for development which lead to the creation of Arfeen international in 1969. The newly formed company with young entrepreneurial talent, soon became a leading supplier of pharmaceutical raw materials and ingredients to the industry, sourcing its supplies from a network of principals and associates around the globe. The company then diversified its operations into newer areas like plastics, industrial chemicals, food and commodity grains, fertilizers, fuel oils etc. The growth was tremendous and to ensure that this growth was duly supported by a strong corporate culture, newer companies lead by dedicated and professional teams were established. Today the Arfeen group has a diversified portfolio of businesses including, petrochemicals, plastics and pharmaceuticals, telecom, real estate and entrainment, building materials, construction and many more to come. 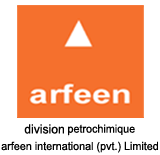 Division Petrochimique of Arfeen International continues to be one of the core businesses of the group. Continuously expanding and ensuring its leadership position trough innovation and dynamic adaption to the emerging challenges with an eye on the future and a competent grasp on the present.